What he forgot to mention is that for the last decade, technological advances in audio engineering have actually made it easier to learn your craft and pursue your dreams as a musician—even for a rocker like Dave Grohl. For this very reason, DJing has become more musically diverse as an art. When you hear BT or deadmau5 or Skrillex do a set, they’re not just playing records; they’re also dropping in synth lines, triggering effects, looping and manipulating beats—in short, they’re performing, and their DJ setup is their musical instrument. If you want to get to this level, you have to begin somewhere. We’re convinced that a technique called harmonic mixing is a great place to start. He didn’t know it then, but Grasso had invented the modern-day art of beatmatching. Today, it’s one of the most basic techniques in a DJ’s repertoire. Like any skill, it takes practice to get it right. So once you’ve crossed that bridge, how can you take that knowledge a step further and bring some real musicality into your set? This is where harmonic mixing comes in. When you’re in the middle of your set and playing one of your favorite tracks, sometimes you’ll find yourself searching through your music collection, trying to figure out the right thing to play next. Harmonic mixing can help you do it. It virtually guarantees that your next track will complement the one you’re playing, and that your mix will sound musically seamless. It sounds like magic, but it’s a real DJ technique with roots in music theory, and it’s used by some of the world’s most popular DJs, including Above & Beyond, Armin van Buuren, David Guetta, Kaskade, Markus Schulz, Sasha, Swedish House Mafia and many more. If you already know how to DJ, you can start using harmonic mixing in a matter of minutes. It’s even a lot easier to learn than beatmatching. Put simply, harmonic mixing helps ensure that your song transitions won’t clash, and it also opens up a wealth of possibilities for creative mixes. What it’s not: a law of mixing. All rules are meant to be broken. Harmonic mixing isn’t a requirement to be a good DJ. It’s merely a useful technique to combine with the rest of your knowledge and skills. Harmonic mixing also doesn’t mean you’re mixing in the same key for the entire night; instead, it means you’re mixing two songs together that are harmonically compatible. The good news is that with the software and hardware available today, it’s really easy to do. As you work with the technique and train your ear to know when a mix is working musically, you’ll find that it can pay huge dividends on the dance floor. 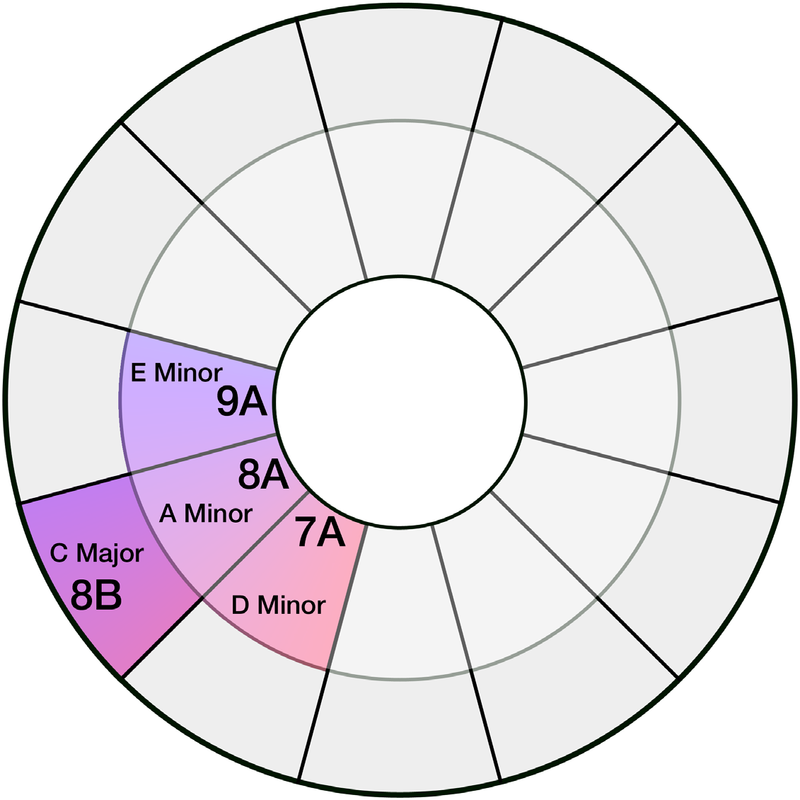 Thankfully, you don’t have to study music theory to learn harmonic mixing. All you really need to know is that virtually every song you play as a DJ is in a certain key. Key names always start with the name of the root note (such as “C”) and the scale (minor). The scales are usually minor or major, so you will see key names like “D flat minor” and “E major” throughout this book. If you’re not already familiar with musical keys, it will take a little time for you to learn the basics. Even if you’re not trying to mix harmonically, you might get lucky if, for example, you’re mixing a solo lead vocal over a monophonic (single-note) synth line. But when you’re mixing chords over chords, involving clusters of notes, you can run into dissonance, and that’s a bad thing. When mixing harmonically, you want both songs to sound as though they could have been part of the same piece of music, with a transition that feels smooth and natural. There’s an art to doing it right, and when you pull it off, your audience will sense it. After years of watching DJs like Sasha and Paul van Dyk, Mixed In Key founder Yakov Vorobyev could tell that they were mixing harmonically. Their sets were always flawless, but it wasn’t obvious how they found the various keys their tracks were in. The common method was to use a piano to find a song’s key beforehand, and then label each piece of vinyl accordingly—a thankless and time-consuming grind. As a DJ himself, Yakov was spinning several nights per week, and he used the piano method to label all his tracks. Mixed In Key software was conceived as a solution to this problem. Why do all this work by hand, when it was possible to analyze and catalogue your entire music library without ever touching a piano? In 2006, Yakov created Mixed In Key 1.0, which analyzed music files to determine the key of each song in seconds. The software was launched as a digital download on Mixed In Key’s website (mixedinkey.com). Since then, the software has been updated over 20 times; version 8.0 was released in late 2016. 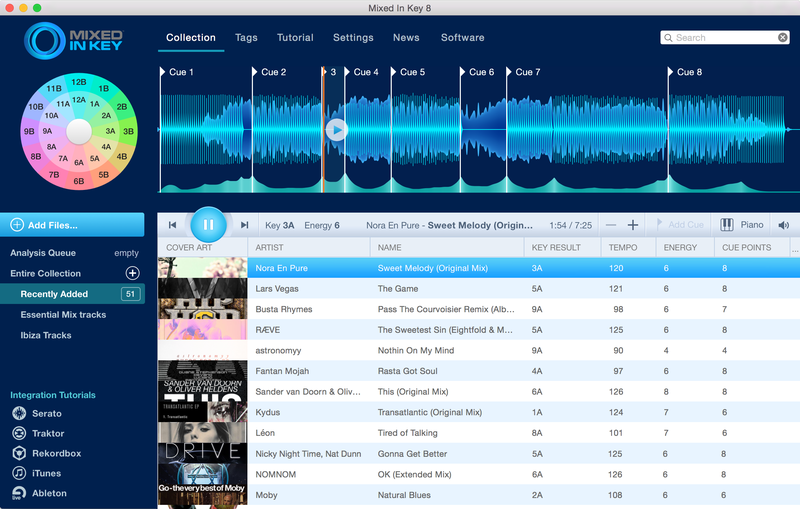 Mixed In Key is a DJ tool that makes it easy to explore your music collection and find songs in the same or compatible keys. It also tags their metadata, so the results will show up on all your favorite DJ software and hardware. For its ease and elegance, and for the time it has saved professional DJs, Mixed In Key has become the industry standard for harmonic mixing. You’ll notice the wheel is comprised of two concentric circles; major keys are on the outer circle and minor keys are on the inner circle. 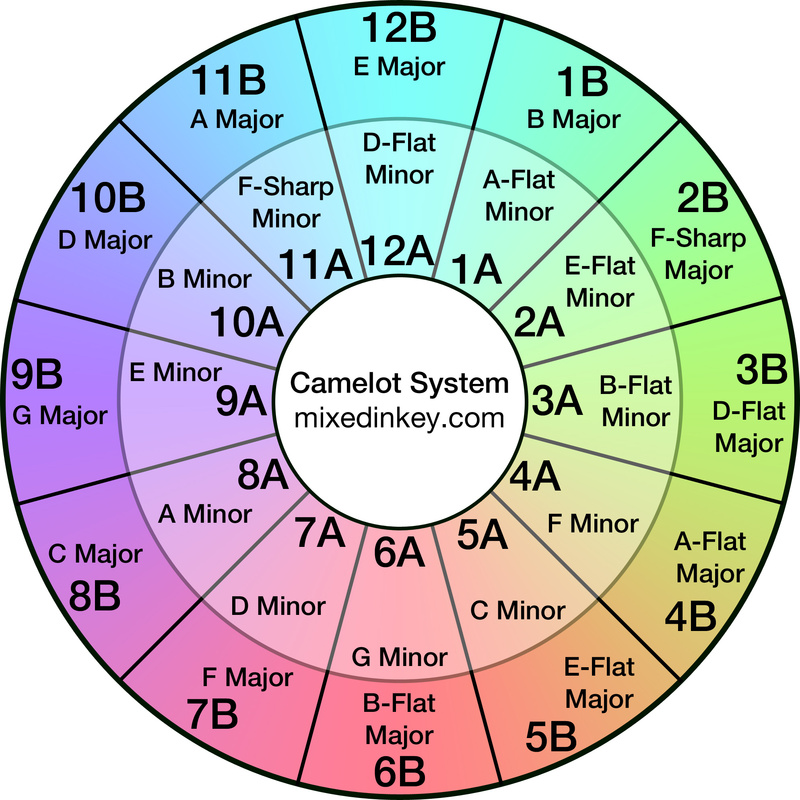 You can start experimenting as soon as you’ve labeled your first ten songs with a Camelot key code. The most basic trick is to try mixing two copies of the same song. If you load up two copies of Kaskade & deadmau5’s “Move For Me,” for example, and then mix them, they will beatmatch perfectly, and they’ll be in the same key, with the notes and harmonies in consonance. You’ll notice the same thing when you start using harmonic mixing with two different songs in the same Camelot key code (let’s say 5A). Load up two songs and mix back and forth between them. That’s harmonic mixing in action, with the pitch and chords in harmony. After you’ve tried mixing two songs in the same key code, try a mix that’s off-key. If you play a song in 5A and mix it into a song with a 10A key code, for example, you’ll notice the difference immediately. The clashing pitch between the two songs creates an uncomfortable dissonance. Finally, try mixing two songs that are in different but harmonically compatible keys. It’s easy to determine a compatible key; for any key on the Camelot Wheel, the three immediately adjacent keys are compatible. So for example, let’s say you’ve started a mix with Kaskade’s “Angel On My Shoulder.” This song is in the key of A minor, which is 8A on the Camelot Wheel. That means you can mix it with any other track in 7A, 8A, 9A or 8B, and feel confident that the result will be a smooth harmonic transition.